Disney and PBS recently aired two new shows in their fall lineup. Animals on wheels have joined the playhouse and dinosaurs on trains lead in Sesame Street. 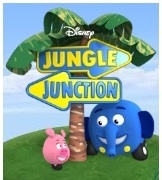 In Jungle Junction a community of animals with wheels as feet live in a road filled jungle and solve problems together. I really enjoy how the show interacts with preschoolers asking them questions and its intentional education. In the episode of “The Treasure of Jungle Junction” I heard them count several times and learn how to share one item. As a mother of a 2 year old I appreciate the counting reinforcement. 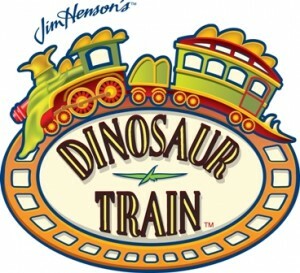 Dinosaur Train combines preschoolers’ fascination of trains and dinosaurs. The series follows, Buddy, a Tyrannosaurus Rex who is adopted by a Pterandon family. Pterandons are a flying dinosaur. Buddy asks lots of questions and hypothesizes about nature. His family uses the dinosaur train to travel through the Mesozoic era to meet different dinosaurs and answer Buddy’s questions. I was super excited about this Jim Henson Production and set my DVR for the first week of shows. My 2 year old daughter recently fell in love with trains and we had been reading the book, “Dinosaur Train” by John Steven Gurney every night. She practically has the book memorized. I knew before the show aired that the show was not like the book, but I still had high expectations. What do you think of these 2 shows? Do your kids love them or are they ambivalent? At the moment, my 2-year-old LOVES Dinosaur Train. Although I’m not sure yet if it’s because she really thinks it’s a great show, or if she’s just fascinated with it because it’s new. She often wants to reenact parts of it, like playing “kick the cone.” She wanted to wait for Buddy to come to the dinner table tonight. It’s a cute show, but as far as educational value, I do prefer its lead-in, Super Why. My 3yo loves dinosaur train from the couple of times she’s seen it. I’m still debating about letting her watch it. I know I will sound like a religious freak here, but the show is very evolutionary in premise, and I don’t like that she would be soaking in a lot of subtle evolutionary terminology and concepts. She finds it very entertaining, though. My boys (age 4 and 2 1/2) have watched Dinosaur Train a couple of times and they loved it too. They love both dinosaurs and trains, so it was a great combo for them. I actually agree with Kristi about the evolution idea. I am not sure if it will be a show we watch a lot of. My 4 year old DD loves Dinosaur Train! She is very into Dinosaurs lately, and been learning about fossils, etc. I watched it with her and she really picked up on some of the education, and has showed that when looking at her recent dinosaur book from the library! We haven’t seen Jungle Junction yet. DD saw a preview and seemed interested, so we might check it out! My 3 year old son and I watched Dinosaur Train for the first time yesterday and he seemed to really like it. He really likes dinosaurs. I was just a little suprised to see them discussing dino poop on the show. My son found this hilarious. I was happy to see they had a paleontologist on to discuss with the kids why fossilized dino poop was so important, but my 3 year old really doesn’t comprehend all that information yet. clarification… not a slight issue… Just meant slight in the terms of I still let my son watch it, but I explain that they are wrong about certain things and then explain the biblical concepts as best I can. He seems to understand it and grasp what I’m saying more than the show b/c we talk about the Bible so much, he is comfortable and trusts it. My 2 year old son absolutely adores Dinosaur Train. He can’t get enough of it. It’s the last thing he wants to watch before bed and the first thing he talks about when he wakes up. He likes it so much that I’ve had to down load episodes onto my phone for him to watch. I’m getting kind of sick of same episodes though, over and over again (I’ve DVRed the shows). The same handful of episodes have been running for a couple of weeks now. Be sure to go online and check out the website for Dinosaur Train at PBS’s website. There are some great interactive games, print outs, and even at home lesson plans. Christy-thanks for those links; I knew there was information like that available and you made my search much faster. My son is almost five and loves trains. I may do what Christy does and let him watch it but talk and explain about things as well. My 2 year old son loves Jungle Junction. He loves cars and animals so it is a good combination of both. I like how it asks questions and is interactive like Mickey Mouse Clubhouse. He loves trains but isn’t really into dinosaurs so we haven’t really watched it plus Mickey Mouse Clubhouse is on at the same time and he likes it better and so do I because it is more educational. Evolution is not in question or debate in the scientific community — it is an accepted scientific principle. It is as close as you can come, in science, to an established fact. Additionally, religious creation and evolution need not be mutually exclusive. Maybe evolution is God’s process of creating plants and animals. But to say stuff like “I’m not sure I want my child to learn about evolution” is, in my opinion, completely insane whacko. Do you believe in bacteria? Do you believe in computers? Do you believe in cars? Well, have you ever seen a bacteria? How does a computer actually work? How does a car work? Bacteria and microcellular organisms were once dismissed as impossible ideas of whacko scientists, but now everyone, even relatively uneducated laypeople, believe that bacteria cause illness, and believe in the Cell Theory as the basic building block of life. But how many people have ever seen a bacteria? I simply cannot comprehend how, in the 21st century, people, even deeply religious people, can believe that the science behind bacteria, cars, computers, and other modern scientific ideas is sound and works, but dismiss evolution as false. That just doesn’t make sense! Incidentally, I think Dinosaur Train is kinda a lousy show. But my boys like it, and it is factually informative, so I guess that’s fine. Thanks for sharing your thoughts and opinions, JDS. The point of the post is to discuss whether or not we like the new shows. Glad your boys like Dinosaur Train! I agree with JDS, except, I enjoy watching the show with my 2 year old. It’s nice to have a science based show that is entertaining. Our children need more influence from science, as does our country. Great job PBS! Wow, I am shocked at how many people “have a problem” with evolution. The theologian and paleontologist Teillhard de Chardin described evolution as something like, “the hand of God reaching out and drawing us toward Himself.” Beautiful. I am a scientist who studies molecular evolution; the reality of evolution is obvious to anyone who takes a serious look at nature. It’s not threatening and it’s certainly not anti-religious. Be not afraid.